The Jacksonville Jaguars defeated the New England Patriots, 31-20, continuing the second full week of action in the NFL. It seemed like New England couldn’t get a single thing going all game long. With limited options downfield, It was almost comical how often Tom Brady was forced to dump it off to his check down. 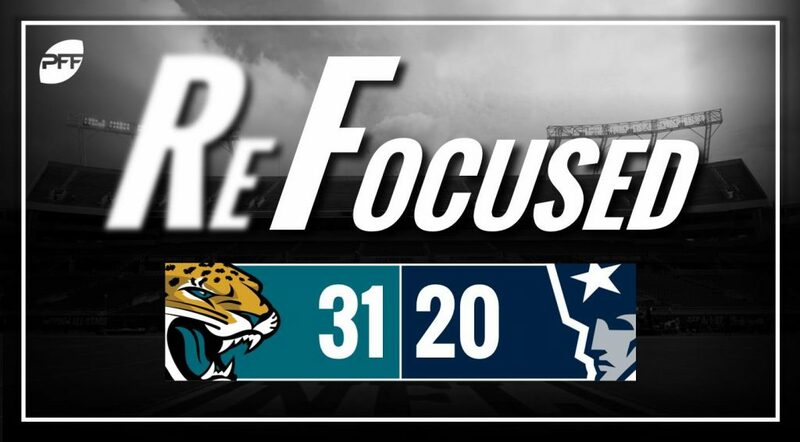 The Patriots lack of athleticism at linebacker showed early and often as the Jaguars ran crossing routes underneath, stressing the Patriots ability to pass off receivers in their zones. They regularly got caught out of position with gobs of open space in front. Through two weeks, cornerback Jason McCourty doesn’t quite look to be the playmaker that Malcolm Butler was. Butler’s ability to stick with shiftier receivers was invaluable and they badly missed that on Sunday. The tackles for New England were an issue all game long. Not just La’Adrian Waddle, but the newly acquired left tackle Trent Brown had his fair share of whiffs. Brady was visibly shaken by the pressure and seemingly quickened up his internal clock. When quarterback Blake Bortles is playing this efficiently, the Jaguars are going to be difficult to beat. He avoided pressure extremely well with his mobility this afternoon and got rid of the ball quickly and accurately when he needed to. The Jaguars defensive line was already unfair, but if Dante Fowler can dominate like he did today, they’ll be even scarier. Waddle had a difficult time handling the fourth-year defensive end, and Fowler exploited the mismatch to the tune of multiple quarterback pressures. The Jaguars’ offensive line held up their end of the bargain. Bortles wasn’t sacked or hit once on Sunday. For a Patriots offense that was predicated on getting yards after the catch, the Jags’ ability to wrap up on first contact was huge. They only missed two tackles all day. The Patriots’ lack of playmakers outside of Rob Gronkowski finally came back to bite them. With no one able to win one-on-one matchups down the field, the Pats’ offense was neutered. Bortles outdueled Brady. There’s no qualifying it. The much-maligned Jaguars signal-caller was the more efficient quarterback on Sunday.